Every Autumn about this time my twin sister Anna goes out to pick rose hips for her yearly Rose Hip Sherry. This is an exceptionally delightful treat for being a homemade spirit. My sister has done this for a while, so her wine cabinet has become full of different vintages of Rose Hip Sherry. Sometimes I have had the honor to be part of her sherry tastings, which she has after an excellent dinner. It really is a fantastic finish to a good meal and I must say the sherry just gets better as it ages. The sherry also works in cooking and Anna says that a dash of Rose Hip Sherry in a Chanterelle sauce is absolutely heavenly! Sound fantastic to me! Roughly trim the rose hips but don’t rinse them with water as the surface contains natural yeast that are useful in the process. Make a sugar syrup by heating up the sugar and the water. When the sugar has dissolved let it cool. Use some of the liquid to dissolve the yeast. Let the yeast start (there will be bubbles on the surface) before mixing with the rest of the sugar liquid and the rose hips in a bucket or a glass carboy. Cover the jar and let the wine sit still for three months. At this time the liquid should look clear and the rose hips have fallen to the bottom of the jar. Tap the sherry into dark bottles (for example on 33 cl (12 fl oz) beer bottles). To avoid the sediment at the bottom Anna recommends to spoon up the sherry instead of pouring (can be hard with a carboy). Seal with a suitable cork or cap. Let the sherry stand for at least one more month before drinking. If your are patient enough to store it, or at least with some of it, my sister thinks it’s best to drink after 5 years. This looks great. My German husband is always brewing stuff around the house – at the moment we have green walnut with red wine and schanpps fermenting away and a huge selection on sloe liqueurs hiding in dark corners. I wonder if there are still rose hips around…? I think there still can be some rose hips out there. At least in some parts of the world! 🙂 I hope you find some! 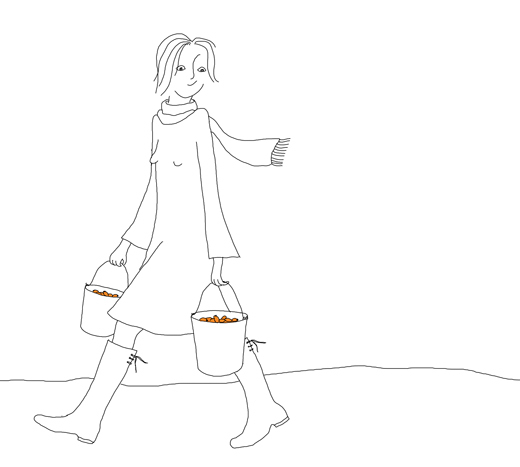 What a beautiful blog you have made here – I love your drawings. Next year when there are rosehips I will know what to do with them, this sounds just fantastic. it is a great treat!